The American Spirit team of the Buckeye Hills Career Center Chapter of SkillsUSA is working to create promotional videos demonstrating the job skills and educational opportunities available to students at Buckeye Hills. The team created five promotional videos, one for each academy of study: Allied Health Academy, Construction Academy, Human Resource Academy, Manufacturing Academy and Transportation Academy. Pictured are the student ambassadors who volunteered to demonstrate the skills they obtained from their career-technical academies. Look for videos on the Buckeye Hills Career Center Facebook page and on YouTube. It is the team’s desire to show future students and employers the job-ready skills and employability traits learned at Buckeye Hills Career Center. Pictured front row left to right: Devan Chesser, Michael Hiller, Dezerrae Nelson, Raeanna Camp, Mason Hall, Karlee Didelotte. Back row left to right: Derek Spencer, Zach Mace, Chase Kemper, Jason Cain, Jacob Simmonds, Killian McGinness. https://www.mydailytribune.com/wp-content/uploads/sites/42/2019/03/web1_Student-ambassadors-2-.jpgThe American Spirit team of the Buckeye Hills Career Center Chapter of SkillsUSA is working to create promotional videos demonstrating the job skills and educational opportunities available to students at Buckeye Hills. The team created five promotional videos, one for each academy of study: Allied Health Academy, Construction Academy, Human Resource Academy, Manufacturing Academy and Transportation Academy. Pictured are the student ambassadors who volunteered to demonstrate the skills they obtained from their career-technical academies. Look for videos on the Buckeye Hills Career Center Facebook page and on YouTube. 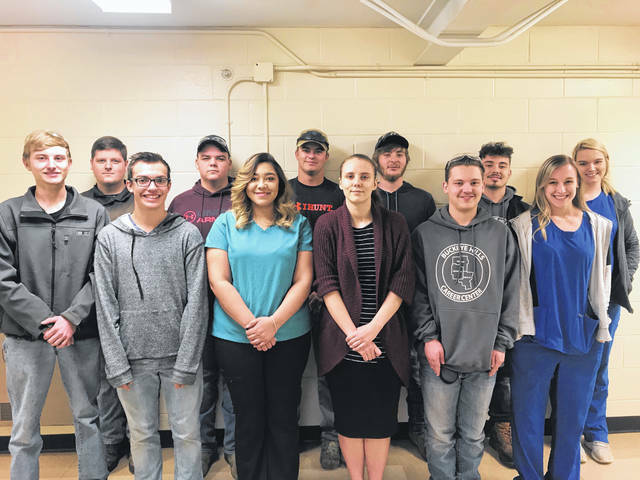 It is the team’s desire to show future students and employers the job-ready skills and employability traits learned at Buckeye Hills Career Center. Pictured front row left to right: Devan Chesser, Michael Hiller, Dezerrae Nelson, Raeanna Camp, Mason Hall, Karlee Didelotte. Back row left to right: Derek Spencer, Zach Mace, Chase Kemper, Jason Cain, Jacob Simmonds, Killian McGinness.